Recently my coworkers and I took the bus to Boston for the day to meet staff we had only spoken on the phone with since a recent merger. My day job had gone from 50 employees in two offices to over 1,500 all over the world. It was time to see where some of the other 97 percent worked. Arriving on a bus in the early afternoon, my coworkers and I walked from South Station to a dock where we met some of the local crew, boarded a pontoon boat and toured the harbor before heading to the office. “Just another day at the office,” I teased next to a Boston skyline photo on my social media. Upon disembarking, we hiked a few blocks and began the real office visit. The Boston staff was friendly and welcoming, but their office environment is very different from our cozy Portland setting with its wooden beams and brick accents. The staff is surrounded by glass, glass, and more glass. Our tour guide admitted walking into walls – and even right into a conference room - when he had been too distracted to look up. It felt like I should have my hands in front of me at all times as we maneuvered around glass everything. Then there was the walking. People who live and/or work in Boston walk in hyper speed and don’t even realize it. I don’t mind walking but my pace is closer to the speed of snail. Toddlers pass me by without losing their breath. My rear regularly brings up the rear on a long-distance walk. In Boston, three blocks can seem like a long distance, especially when trying to keep up the pace that other younger, healthier, more experienced hoofers have set. I get it, Boston, you’re America’s Walking City. By the time we got back on the bus to come home, I was too wiped out to keep my ear plugs in and concentrate on whatever Katherine Heigl movie was playing. Plus, I was having a hard time seeing the screen above the head rest in front of me. Yes, I am that lacking in height. Second Born also headed to Beantown last week to meet with college friends in celebration of her 23rd birthday. Their agenda was slightly different. Fun was the priority, and they had plenty of it. Walking was also a big part of the weekend. I’ve walked with Second Born. I should say, I’ve almost busted a lung keeping up with Second Born, and she’s slow compared to First Born and The Groom when they lived in Philadelphia. From twenty paces behind I’d typically wave to them saying I’ll catch up. Philly came up in conversation when our youngest returned home from her birthday weekend. 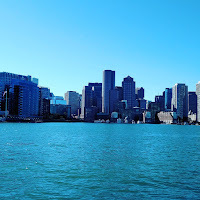 While Boston is a great place to visit and I can see why young people would want to head there, Second Born had a different perspective about her time there. While I thought the weekend would remind her of everything the Hub had to offer – plenty of activity, shopping and restaurants, as well as various employment opportunities – there was one aspect of this city I hadn’t considered. She absolutely hated the traffic. In fact, she said, Boston made her miss Philly. Are return trips to the City of Brotherly Love in our future? Spouse and I spent a decent amount of time in Philadelphia when the Love Couple resided there. It felt a bit intimidating to me, but First Born walked the town like she had lived there all her life. Her sister loved to visit and had no qualms about driving in Philly because the grid made sense to her. Nothing about Boston roads make sense to her or anyone. With the possibility of Second Born pursuing relocation to another walking city, I’m thinking I might want to get out and take a few steps at a time to shape up for future visits. Maybe by the time she settles into a new city I’ll only be ten paces behind. What's that cat catching now?